The biggest financial institution in Florida, $14 billion BankUnited of Coral Gables, was told by its regulator, the Office of Thrift Supervision, to find a buyer who would raise its depleted capital to acceptable levels or risk a government takeover. In an ominously sounding "prompt corrective action directive", the OTS has essentially given the bank a 20 day ultimatum. If Florida's biggest bank is on the hook, at a potential maximum taxpayer cost of $14 billion, maybe the stress test will not be just the fluff everyone is now expecting it to be. Then again, Citi, with its $3 trillion in assets, being told to find a buyer in under three weeks, may not be the most amusing notion for Vikram Pandit and Sheila Bair. PS. Now that Goldman is a "retail" bank, don't they need a dpositor base? Anyone know the Stardust odds are on GS acquiring BankUnited in the next 2-3 weeks (with a loss sharing contract with the FDIC in place of course)? "We are not taking significant credit risk that might end up being absorbed by the taxpayer. For almost all the loans made by the Federal Reserve, we look first to sound borrowers for repayment and then to underlying collateral." Citi is a sound borrower? Met Life is a sound borrower? Probably yes... if the soundness is determined by the joke that are the "stress" tests: everyone is all too well aware that all 19 stress testees will pass. How long they will survive after they "pass", especially once unemployment hits a possible high 20% (if corporate spreads are any indication) relative to the government's downside case in the 8-9% range, only time will tell. The more relevant question is what is the true quality of the collateral that the Fed is willing to accept in exchange for providing taxpayer cash as loans to assorted institutions of all shapes and sizes. The data below demonstrates that as the credit crisis has progressed, the Fed has become willing to accept more and more risky collateral, with some of the most recent incarnations of the program essentially accepting any assets, including the toxic variety. 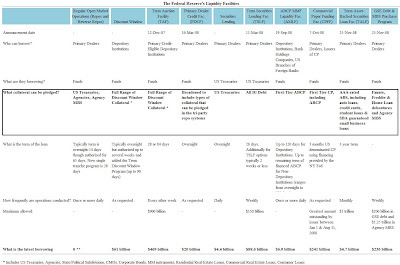 As Zero Hedge has disclosed previously, the chart below demonstrates the various bailout programs (and key bailout players) sorted chronologically. The dangerous thing here is that as time has evolved and the crisis has deepened, the Fed has become willing to accept much less sound assets as collateral, initially the default being safe US Treasuries (although with US Debt/GDP likely to skyrocket past 100% over the next several years, even this category can be perceived as risky), however the bar has subsequently dropped lower and lower to include first tier commercial paper, investment grade debt, and at the bottom of the rung: a full range of discount window collateral which includes, among others, residential and commercial real estate loans, CMOs, and corporate bonds. Does this telegraph that the Fed, in loosening its high quality collateral standards, is anticipating expanding the bailout programs to a point where it is willing to accept not only HY bonds as collateral but outright equities? The last preposition is frightening, especially if there is any direct or indirect method that the Fed or the Treasury possess in order to manipulate equity price levels, as this would effectively translate into the biggest conflict of interest in history. But even assuming that conspiracy theories are too far-fetched for the purpose of this rational discourse, the declining collateral quality trend is very troubling. 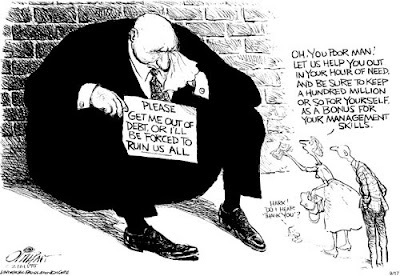 If eventually the system reaches a point where taxpayer money is collateralized by the investments (speculations) that these very same taxpayers (for the most part) invest in equities and other market securities, the circular logic of bidding up assets in order to prevent collateral quality from falling (and thus wiping out taxpayers) will become the de facto norm. In a way, this puts yet another twist in the ongoing bifurcation between U.S. taxpayers and U.S. investors who very often are the very same individuals. The conclusion is that if one did not fear the "full faith" retaliation of the U.S. government, one would be tempted to define Kohn's statement as not only groundless cheerleading, but ultimately predatory disinformation dissemination. However, as we here at Zero Hedge observe our daily fear of the abovementioned phenomena, we would not go so far as to make that broad an assumption. Instead we will leave this topic as an open question, welcoming reader feedback, and hope to have provided sufficient food for thought as the U.S. economy deteriorates more and more from the consequences of the biggest credit unwind in the past 70 years. One additional point with regard to reader feedback: commenting at Zero Hedge is meant to be an open forum for information exchange and discussions. However, an alarming trend is the observation of trolling by certain commentators, who abuse the above principle for the sake of populating comment threads with no meaningful benefit to anyone, and outright character attacks at times. This behavior will not be tolerated and individual IP addresses as well as entire domains will be banned from commenting without prejudice going forward. This is a first and last warning. When Zero Hedge first presented its thesis about a likely upcoming mega squeeze in Citi common concurrent with the bank's shares trading at $1, some readers expressed their dismay with our lack of intellectual capacity. Less than two months later, and $3 dollars higher, the situation has changed... at least for the Citi shorts. Accounting and government magic - the recasting of FASB157 enables financial institutions to defer the recognition of losses with the result that C's March trading profits swung from a $6.8B loss to a $3.8B gain. Another item worth reviewing is the decline in interest expense from $16.5B last year to $7.7B this year. Nonetheless, much more equity capital is needed. Beyond the conversion of preferred to common, watch the form of any additional capital. The Fed and Treas. have guaranteed $306B of C's assets, have injected $45B in preferred and converted to common leaving few additional options. The problem is that C has $2T of assets ($3+T including off balance sheet assets) whose values are depressed by 10% to 20%. C needs to be watched. Egan Jones is not alone in their condemnation of Citi's grotesque Criss Angel-esque interpretation of reality. The consensus seems to be thumbs down for the bank, even though the latter, together with the balance of the worst companies in the S&P, has benefited mightily from the less and less connected to reality "crap rally" (but more and more connected to quant fund deleveraging and viability). What happens now? The market has reached a very curious inflection point, which is eerily reminiscent of what happened to the basis trade in the post-Lehman days (just ask Boaz Weinstein for advice if the equity market is cheap now). Liquidity is disappearing - in fact with every market uptick more and more quants and L/S funds deleverage if they can, while some are stuck and have turned their phones off entirely. Ironically, the higher the market goes, the higher the probability that we will see not just a few small quants blowing up, but some of the big guys also taking a bullet to the temple. In a hypothetical case where a $100 billion+ provider of market liquidity ceases to function the market will break, pure and simple: this is not a directional bet, this is a volatility bet. Ironically Citi common is now the basis trade reincarnated in the ongoing market melt up. As liquidity becomes scarcer and scarcer, Citi's stock price is likely among the best barometers: this manifests in lack of borrow, in high trading costs, increasing repo rates, as well as the threat, despite repeated promises to the contrary, of an adjustment in the common-preferred conversion rate. In an extreme example it is easy to see the stock skyrocketing to multiples of its current price, however when (not if) fundamentals take over, the way down will be quick and painful. And while Jim Cramer likely top ticks the rally yet again, and Barney Frank wants to guarantee every risky asset in the United States in another misguided attempt of postponing the D-Day for all the fiscal and monetary insanity happening in this country, the FDIC announces that 2 more banks have failed (bringing the 2009 total to 25), which will cost the FDIC (aka taxpayers) $100 million and $143 million, respectively. And while we are on the topic: Sheila, maybe you can at least tells us if the FDIC's Depository Insurance Fund has finally gone negative, especially now that your brilliant actions have made it unneccesary for banks to use the TLGP and thus pay the FDIC the recently increased TLGP fee? PS: Based on these headlines, maybe Messrs Dudley and Kohn can join Mr. Cramer in the Wall Street Top Tickers cheerleading camp (Zero Hedge to provide its thoughts on Mr. Kohn's misrepresentation of reality shortly). Then again, if even the market custodians of the Federal reserve are doing all they can to get every last retail investor to believe this bear market rally is for real and incite a market liquidity event, then there truly is no hope. Perspectives from Eric Sprott as a result of heightened reader inquiry. And for a great CNBC antidote, click here and here: interviews with Sprott, Roubini, Meredith Whitney and Ian Gordon. Yesterday, as Americans paid their taxes and partied like it was 1773, China took yet another action little noticed in the American media, but with major long term implications. China finalized a deal with Argentina, arranging a $10.2bn currency swap of their respective currencies (70bn CNY/38bn ARS). While Michele Bachmann and the like were up in arms after Zhou Xiaochuan, Governor of the People’s Bank of China (PBoC), suggested that SDRs could potentially function as a new global reserve currency, this particular story appears to have garnered little attention from those paranoid of a “one world currency“. However, this development is of crucial strategic importance and should be recognized by US policymakers as a development that must be addressed, rather than proposing legislation that doesn’t even begin to make any sense. As Xinhua reports, the Argentines can essentially use the RMB as extra cash to pay for imports. But one might note that, since the Yuan is not a convertible currency, the money can only be used to purchase goods from — you guessed it — China, potentially giving a boost the Dragon’s ailing export sector. China’s economy has suffered along with the rest of the world since they have long been reliant on export-led growth, and in this market, major trading partners just aren’t importing any more. And so this currency swap is shrewd move for China, in that it has the dual effect of both promoting Chinese exports to Argentina, while also allowing this trade to be settled in Yuan rather than Dollars. Michele Bachmann’s paranoia meter should have been turned up a notch, since with this move, China has slowly begun initiating a shift away from the USD while simultaneously increasing its economic presence in an unfamiliar region. It marks yet another step towards full convertibility of the Yuan. While the swap shouldn’t incite outright panic, US policymakers need to recognize these coordinated actions in the broader context. This isn’t just about the US Dollar: it’s about our leadership role in these regions. This swap is the sixth of its kind since this past December, with South Korea, Malaysia, Indonesia, Hong Kong and Belarus all coming to similar arrangements with the PBoC, totaling 650bn CNY ($95bn USD). Note that last fall, as the Federal Reserve “stepped it up” and arranged currency swaps with many central banks, including swaps worth $30bn USD with both Brazil and Mexico, economies like Argentina were left out. Romero and Barrionuevo at the NYT have documented a number of additional coordinated initiatives China is taking in nations generally ignored by the US, including direct loans to Ecuador and Venezuela. Spreads were mixed in the US today with IG worse, HVOL improving, ExHVOL weaker (thanks to high beta short-squeeze), XO stronger, and HY selling off. Indices typically underperformed single-names (for the fifth day in a row) with skews mostly narrower as IG underperformed but narrowed the skew (to its tightest of 2009), HVOL outperformed but widened the skew, ExHVOL intrinsics beat and narrowed the skew (to almost zero), XO underperformed but compressed the skew, and HY's skew widened as it underperformed. The names having the largest impact on IG are International Lease Finance Corp. (-80.87bps) pushing IG 0.48bps tighter, and American International Group, Inc. (+63.32bps) adding 0.3bps to IG. HVOL is more sensitive with International Lease Finance Corp. pushing it 2.22bps tighter, and American International Group, Inc. contributing 1.37bps to HVOL's change today. The less volatile ExHVOL's move today is driven by both Avnet Inc. (-25bps) pushing the index 0.26bps tighter, and Lowe`s Companies, Inc. (+10bps) adding 0.11bps to ExHVOL. The price of investment grade credit fell 0.15% to around 96.66% of par, while the price of high yield credits fell 0.07% to around 75.56% of par. ABX market prices are higher (improving) by 0.02% of par or in absolute terms, 0.02%. Broadly speaking, CMBX market prices are higher (improving) by 0.03% of par or in absolute terms, 0.11%. Volatility (VIX) is down -1.85pts to 33.82%, with 10Y TSY selling off (yield rising) 11.3bps to 2.95% and the 2s10s curve steepened by 4.8bps, as the cost of protection on US Treasuries fell 1bps to 42.5bps. 2Y swap spreads widened 3bps to 60.5bps, as the TED Spread tightened by -1.5bps to 0.97% and Libor-OIS improved 1.1bps to 90.4bps. The Dollar strengthened with DXY rising 0.88% to 85.981, Oil rising $0.21 to $50.19 (outperforming the dollar as the value of Oil (rebased to the value of gold) rose by 1.41% today (a 1.3% rise in the relative (dollar adjusted) value of a barrel of oil), and Gold dropping $8.54 to $867.16 as the S&P rallies (870.2 1.01%) outperforming IG credits (177.38bps -0.16%) while IG, which opened tighter at 173bps, underperforms HY credits. IG11 and XOver11 are +3.5bps and -4.42bps respectively while ITRX11 is +0.5bps to 148.5bps. The majority of credit curves flattened as the vol term structure steepened with VIX/VIXV decreasing implying a more bearish/more volatile short-term outlook (normally indicative of short-term spread decompression expectations). Dispersion fell -3.1bps in IG. Broad market dispersion is a little greater than historically expected given current spread levels, indicating more general discrimination among credits than on average over the past year, and dispersion increasing more than expected today indicating a less systemic and more idiosyncratic spread widening/tightening at the tails. 52% of IG credits are shifting by more than 3bps and 61% of the CDX universe are also shifting significantly (less than the 5 day average of 65%). The number of names wider than the index stayed at 48 as the day's range rose to 8.5bps (one-week average 9.1bps), between low bid at 171 and high offer at 179.5 and higher beta credits (-2.18%) outperformed lower beta credits (-1.36%). In IG, wideners were outpaced by tighteners by around 3-to-1, with 28 credits wider. By sector, CONS saw 38% names wider, ENRGs 19% names wider, FINLs 24% names wider, INDUs 14% names wider, and TMTs 9% names wider. Focusing on non-financials, Europe (ITRX Main exFINLS) underperformed US (IG12 exFINLs) with the former trading at 148.38bps and the latter at 148.37bps. Cross Market, we are seeing the HY-XOver spread decompressing to 465.53bps from 458.25bps, but remains above the short-term average of 447.65bps, with the HY/XOver ratio rising to 1.57x, above its 5-day mean of 1.53x. The IG-Main spread decompressed to 28.88bps from 25.63bps, but remains above the short-term average of 23.84bps, with the IG/Main ratio rising to 1.19x, above its 5-day mean of 1.16x. In the US, non-financials outperformed financials as IG ExFINLs are tighter by 2.9bps to 148.4bps, with 60 of the 104 names tighter. while among US Financials, the CDR Counterparty Risk Index rose 0.68bps to 207.64bps, with Brokers (worst) wider by 0.5bps to 247.58bps, Finance names (best) tighter by 29.43bps to 914.21bps, and Banks tighter by 7.31bps to 263.2bps. Monolines are trading tighter on average by -77.27bps (2.64%) to 2635.49bps. In IG, FINLs outperformed non-FINLs (2.18% tighter to 1.94% tighter respectively), with the former (IG FINLs) tighter by 9.9bps to 445.2bps, with 11 of the 21 names tighter. The IG CDS market (as per CDX) is 8.6bps cheap (we'd expect LQD to underperform TLH) to the LQD-TLH-implied valuation of investment grade credit (168.79bps), with the bond ETFs outperforming the IG CDS market by around 11.28bps. In Europe, ITRX Main ex-FINLs (outperforming FINLs) rallied 0.21bps to 148.38bps (with ITRX FINLs -trending tighter- weaker by 3.34 to 149bps) and is currently trading tight to its week's range at 0%, between 157.31 to 148.38bps, and is trending tighter. 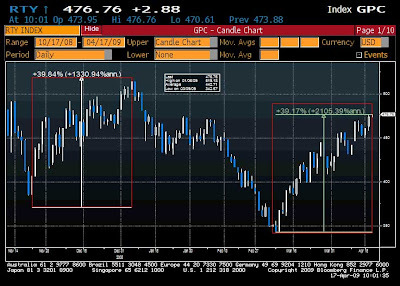 Main LoVOL (sideways trading) is currently trading in the middle of the week's range at 55.54%, between 107.12 to 104.66bps. ExHVOL underperformed LoVOL as the differential decompressed to -0.53bps from -8.52bps, and remains above the short-term average of -7.97bps. The Main exFINLS to IG ExHVOL differential compressed to 42.88bps from 52.45bps, but remains below the short-term average of 54.76bps. CDR LQD 50 NAIG091 -3.14bps to 228.89 (19 wider - 25 tighter <> 19 steeper - 31 flatter). CDX12 IG +3.75bps to 177.38 ($-0.15 to $96.66) (FV -4.08bps to 194.45) (30 wider - 70 tighter <> 50 steeper - 72 flatter) - No Trend. CDX12 HVOL -14bps to 405 (FV -11.5bps to 510.85) (9 wider - 19 tighter <> 12 steeper - 18 flatter) - Trend Tighter. CDX12 ExHVOL +9.36bps to 105.5 (FV -2.02bps to 107.54) (21 wider - 74 tighter <> 52 steeper - 43 flatter). CDX11 XO -8bps to 425.4 (FV -10.02bps to 482.86) (8 wider - 22 tighter <> 14 steeper - 20 flatter) - Trend Tighter. CDX12 HY (30% recovery) Px $0 to $75.63 / 0bps to 1286.2 (FV -36.02bps to 1139.82) (20 wider - 74 tighter <> 70 steeper - 25 flatter) - Trend Tighter. LCDX10 (55% recovery) Px $-0.19 to $76.42 / +13.16bps to 1349.59 - No Trend. MCDX11 0bps to 190bps. - No Trend. CDR Counterparty Risk Index rose 0.68bps (0.33%) to 207.64bps (10 wider - 5 tighter). CDR Government Risk Index fell 0.67bps (-0.98%) to 67.44bps. DXY strengthened 0.88% to 85.98. Oil rose $0.21 to $50.19. Gold fell $8.54 to $867.16. VIX fell 1.85pts to 33.82%. 10Y US Treasury yields rose 11.3bps to 2.95%. "For every seller there is a buyer." 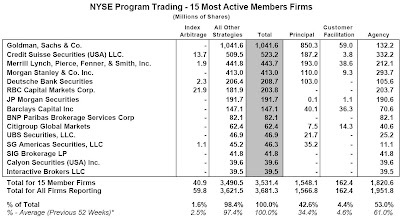 Goldman Sachs continues its to trounce everyone in principal program purchases, its 850 million principal shares representing 81% of all its traded shares, more than half of all NYSE reporting firms principal trades. Maybe Goldman can focus on servicing its "clients" instead of "itself" for once. Zero Hedge presented some perspectives on how broken the market is yesterday. The trend continues as today's quant deleveraging trade already finished (market neutral quants down 17% in March, April likely much worse). Currently momo quants and marginal institutions and retail are buying, driving on fumes, and about to suicide the market (there is a reason Zero Hedge used an ecosystem analogy previousy: currently there is utter disequilibrium in the market and it is getting worse with every uptick). The bagholders are already in place (nobody ever learns from prior mistakes). Marginal L/S quants are forcing the "rubber band" to snap, to use the words of Matt Rothman, hitting reversion programs intraday (as readers point out, "if it works, why go against it"), and selling negative ETF violently while buying the worst stocks, trying to force the biggest market squeeze in recent history. In the meantime the feedback loop between a technically driven rally and consumer confidence continues: market up, confidence up. Of course, that fact is too obvious to even need pointing out. 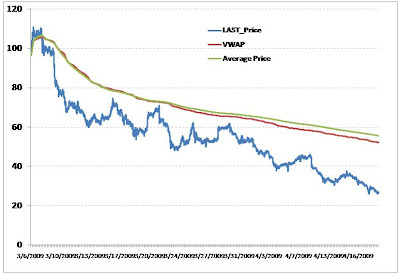 Case in point: SRS VWAP since March 6 is at $52.02 after 35.45 billion shares traded (average price is $55.62), compared to its current price at 50% lower on micro volume push downs from marginal and gap selling. No trade recommendation here, just presenting the facts. Choice selections among David Rosenberg's main weekly observations. The S&P 500 can still rally another 15% from here without violating any long-term trendline that has defined the bear market. So, who is to say that this upturn does not have more legs? 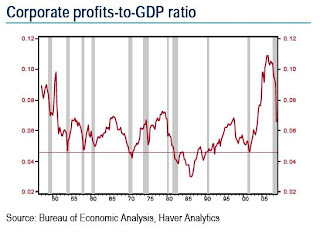 But we are still convinced that the down profit cycle has more to run. Look at the nearby chart, which presents National Account profits relative to GDP – a proxy for margins. People who look at the earnings plunge and deem t his to have been the worst setback ever and note how we have broken all the peak-totrough declines in the past fail to take into account the starting point – the profit-to- GDP ratio at the 2006 peak hit an all-time high of 10.9% – not once did it ever even cross above the 10% threshold in the 60-year history of the data. A normal peak was typically around 7%, and today it is 6.6% – after the sharp slide this cycle, it is actually close to prior bull market peaks, believe it or not. The average recession trough is 4.6%, so on that basis we are basically two-thirds of the way though the margin compression phase and seeing as we think nominal growth is likely to be flat over the next two years, a complete normalization of this ratio would imply a further 30% downside potential for corporate profits. Applying that to S&P 500 operating earnings would actually put them at risk of bottoming at $35 at some point over the next two years, which in turn means we have a forward multiple of very close to 25x, which is simply too rich for our liking. Retail sales came in markedly weaker than expected in March, down 1.1% M/M versus estimates for a modest gain. The results also suggest that the majority of tax refunds (up 15% Y/Y) are being directed toward paying down debt or savings at the expense of spending. or at an annual rate exceeding -20% in March. The only areas of the retail sphere that managed to eke out any gains at all were the ones that would ordinarily be associated with an economy knee-deep in recession – food and pharma with 0.4% increases apiece. CPI rose by 0.2% over the month, led by an 11% jump in tobacco prices, which alone added 0.1ppt M/M. Higher wholesale prices and a record hike in federal taxes (set to go into effect in April, but started to pass through in March) were reflected in the tobacco index. except prevent an outright deflationary environment from taking hold. The inflation trade is totally an overplayed card, in our view. The reality is that it is not economists or market pundits on television who determine the pricing of goods and services that go into the CPI and the PPI. As the latest NFIB small business survey shows, the net share of companies intending to raise prices has plunged for eight months in a row to now stand at ZERO. Nada. For the first time ever, the net share of small businesses that are planning price increases over the next six months has totally vanished. NFIB intentions regarding wage increases have also collapsed to zero – again for the very first time. Based on this data, we would have to conclude that even with all the gobs of government intervention, deflation risks continue to trump inflation risks. That the equity market has enjoyed a very sharp and snappy short-covering rally over the past month has not dissuaded us from this viewpoint. which collapsed 29%. Single-family starts actually held on to the February surge and stabilized at 358,000 units. The fact that (i) and (ii) are just a tad contradictory does not seem to matter. While it may well be true that starts have bottomed – they aren’t going to zero – the bottom line is that housing starts are at their second lowest level on record despite the best affordability conditions in over a generation (data going back to 1959). What does not seem consistent with the newly found pervasive view that we are seeing a significant thaw in the credit markets is the sustained deterioration we are seeing in consumer credit quality: Nearly 10.2% of borrowers who took out an FHA-backed loan in the first quarter of 2008 became delinquent in the next ten months. The comparable data a year ago covering 1Q07 loans were 9.4%. In February 2009, 12.3% of the FHA mortgages that were issued in 2007 were seriously delinquent (more than 90 days past due). This was just one development among many that boosted the total FHA default rate to 7.46% in February from 6.16% a year ago. Is this a green shoot or a yellow weed? For the first time in its 75-year history, the FHA is considering a request for taxpayer funds. Of course none of this matters in a market trading on technical factors. But it will once the unwinds end and the speculators leave the casino. Bloomberg reports that Larry Fink's BlackRock has taken over R3 Capital Management, a $1.5 billion credit hedge fund started by ex-Lehman corporate bond trading desk head Rick Rieder. R3, which was previously part of Lehman Brothers and subsequent to Lehman's bankruptcy, was purchased by Rick Rieder and other management members for the paltry sum of $250 million. Rieder has joined BlackRock as head of its fixed-income alternatives portfolio team and will continue to manage the R3 funds, according to a memo sent yesterday to BlackRock employees. Bobbie Collins, a spokeswoman for the New York-based firm, confirmed the memo today and declined to comment further. Other members of the R3 team who are joining BlackRock include J. Richard Blewitt, Russell Brownback, Leland Hart, Michael Lipsky, Mike Phelps, John Stein, Josh Tarnow, Paul Tice, and Michael Weaver, according to the memo. Lehman Brothers in October sold its 45 percent stake in R3for $250 million and made a new $250 million passive investment in R3’s fund, which can’t be divested until May 2011, R3 said in an October statement. The R3 situation is curious as it basically occurred in a bankruptcy court firesale, with very little disclosure on just what assets and liabilities were being acquired by the R3 general partners from Lehman, and if any of the other Lehman firesales were an indication (Lehman U.S. brokerage assets, Neuberger Berman), the bankrupt estate likely lost out on any potential upside due to Judge Peck's desire to speed through any asset sale at warp speed. However, that should be a concern for the Lehman offical and ad hoc creditor committee (and their legal advisor Milbank Tweed) - if they were ok with hitting whatever lowball bid came their way, it is their issue. 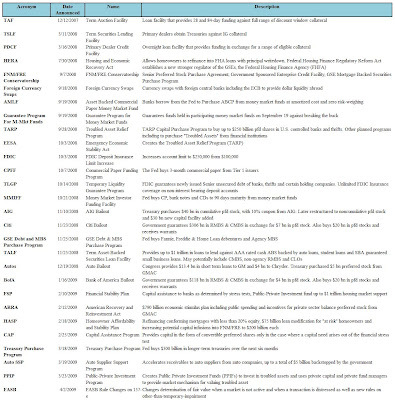 Zero Hedge discloses all the deals and loans which will inevitably suffer as a result of GGP's bankruptcy, in order to allow readers to make their own conclusions whether or not Bill Ackman's thesis is correct. One interest tangent: GGP's CMBS entities have filed for bankruptcy as well. This is shocking as these securitized malls had been structured as bankruptcy remote special purpose entities, which, traditionally, is designed to prevent individual properties from being consolidated in the event the parent declares bankruptcy. Lender protections have disappeared. A likely very adverse ramification is that each of GGP's loans will be moved to special servicer status, implying increased special servicing fees, and further reducing recoveries to lenders. Much has been made about the Chinese connection with regards to copper demand since our last piece on the subject. This piece indicates that Chinese are gearing up for a manufacturing and construction rebound as supplies fall, prices rise, and Chinese indicators are showing bullish signs that are increasingly rare - being first order positive rather than second order. However, we don't see this as a continuing trend and have to stick with the fundamentals that we highlighted in the previous post. The biggest addition to the discussion has to be a serious consideration of how accurate the officially reported China numbers are. While major economic numbers are usually reported with a straight face by the popular media (TV, radio, blogs, etc.) there typically are a number of mental modifiers and gymnastics that we have to apply in order to get to reality. For example, the NAR and NAHB (National Association of Realtors/Home Builders) regularly release numbers that are usually greeted with poorly hidden snickers, especially highlighted in recent times given the real estate market and the positive picture that they attempt to paint. The universal discount factor is always about assessing the releasing body's capacity for underlying motive vs. shame/guilt/outside pressures, etc. On this dimension, we have very little confidence that Chinese manufacturing and GDP numbers are anywhere close to reflecting reality. As reflected in this Fortune piece, the external view of the US economy seems to be a highlight that capitalism is a failed model. When times are good, capitalism is a tough enough sell but when the system is down for the count the discussion shifts from a philosophical to a political arena. In that context, for a country like China, we have to seriously doubt the veracity of their numbers and the conclusions that can be drawn thereof. As we have mentioned previously, the best way to assess China is in a (1 - rest of world) model and based on that picture, and the highly export-driven nature of the Chinese economy we have to believe that copper is likely to fall once the unsustainable reserve buying dries up and the current market insanity subsides. Of course, we are not as well-versed in the geopolitics of the area but it certainly is an area which we will do more research on and post our thoughts over the next few weeks. And some readers call Zero Hedge pessimistic. April 16 (Bloomberg) -- David Tice, the chief portfolio strategist for bear markets at Federated Investors Inc., said the Standard & Poor’s 500 Index will probably plunge about 62 percent. He spoke during a Bloomberg Television interview today. The Federated Prudent Bear Fund that he founded returned 6.7 percent last year as the S&P 500 plunged 38 percent, the most since 1937. Tice said the benchmark index for U.S. stocks may slump to about 325. It closed today at 865.30. The measure has surged 28 percent since March 9, the most in five weeks since the 1930s. Have Icahn And Howard Marks Loaded Up On MGM Mirage CDS? Such is the conclusion based on a Bloomberg article that notes that MGM Mirage is being pressured by none other than Icahn and Oaktree Capital. According to Bloomberg, "Icahn and Oaktree purchased hundreds of millions of dollars of MGM Mirage bonds and have told the company it should overhaul its debts in bankruptcy, the Wall Street Journal reported, citing unidentified people familiar with the matter. The investors contacted the company last month to say bankruptcy is the best option, the newspaper reported." Neither the WSJ nor Bloomberg mention the possibility that the two distressed investors may have loaded up on bad, evil, terrorist-even CDS and are hoping to get cashed out that way. Observant readers point out that as recently as this past week, the MGM net notional exposure went from $1.4 billion to $4.1 billion per DTCC: if any regulators still care about something more than killing equity shorts, this may be worth their invaluable time. MGM's CDS is currently trading 49/51 upfront, or roughly 3,200 bps running. The CDS hit a wide of over 8,000 bps on March 8, indicating what the profit potential is to holder of CDS. Of course, MGM Mirage has options in dealing with CDS-armed "terrorizers" (Zero Hedge would be happy to discuss these with pa Kirk) and avoid getting forced into a bankruptcy by distressed negative-basis loaded banditos. Alternatively, 1yr/5yr flatteners here may seem oddly attractive for ballsy accounts. Spreads were mixed in the US today (amid low volumes) with IG tighter, HVOL improving, ExHVOL weaker (as HVOL arb helped), XO stronger, and HY rallying. Indices typically underperformed single-names (for the fourth day in a row as index arb remains active) with skews mostly narrower as IG underperformed but narrowed the skew, HVOL underperformed but narrowed the skew, ExHVOL intrinsics beat and narrowed the skew, XO underperformed but compressed the skew, and HY's skew widened as it underperformed. The names having the largest impact on IG are Hartford Financial Services Group (-68.28bps) pushing IG 0.51bps tighter, and Yum! Brands Inc (+2.5bps) adding 0.02bps to IG. HVOL is more sensitive with Hartford Financial Services Group pushing it 2.34bps tighter, and Motorola Inc. contributing -0.18bps to HVOL's change today. The less volatile ExHVOL's move today is driven by both Avnet Inc. (-25bps) pushing the index 0.25bps tighter, and Yum! Brands Inc (+2.5bps) adding 0.03bps to ExHVOL. The price of investment grade credit rose 0.09% to around 96.79% of par, while the price of high yield credits rose 0.13% to around 75.63% of par. ABX market prices are higher (improving) by 0.05% of par or in absolute terms, 0.26%. Broadly speaking, CMBX market prices are higher (improving) by 0.05% of par or in absolute terms, 0.14%. Volatility (VIX) is down 0.38pts to 35.79%, with 10Y TSY selling off (yield rising) 6.8bps to 2.84% and the 2s10s curve steepened by 2bps, as the cost of protection on US Treasuries fell 0.3bps to 43.5bps. 2Y swap spreads widened 2bps to 57.5bps, as the TED Spread widened by 1.4bps to 0.99% and Libor-OIS improved 0.6bps to 91.5bps. The Dollar strengthened with DXY rising 0.17% to 85.227, Oil rising $0.76 to $50.01 (outperforming the dollar as the value of Oil (rebased to the value of gold) rose by 3.32% today (a 1.71% rise in the relative (dollar adjusted) value of a barrel of oil), and Gold dropping $15.3 to $875.75 as the S&P rallies (859.6 1.31%) outperforming IG credits (174bps 0.09%) while IG, which opened wider at 176.25bps, underperforms HY credits. IG11 and XOver11 are -4.5bps and -25.12bps respectively while ITRX11 is -5.09bps to 148bps. Dispersion fell -9.7bps in IG. Broad market dispersion is a little greater than historically expected given current spread levels, indicating more general discrimination among credits than on average over the past year, and dispersion increasing more than expected today indicating a less systemic and more idiosyncratic spread widening/tightening at the tails. 60% of IG credits are shifting by more than 3bps and 67% of the CDX universe are also shifting significantly (more than the 5 day average of 64%). The number of names wider than the index increased by 1 to 49 as the day's range rose to 7.5bps (one-week average 9.4bps), between low bid at 170.5 and high offer at 178 and higher beta credits (-5.51%) outperformed lower beta credits (-3.7%). In IG, wideners were outpaced by tighteners by around 8-to-1, with only 7 credits wider. By sector, CONS saw 11% names wider, ENRGs 6% names wider, FINLs 10% names wider, INDUs 0% names wider, and TMTs 0% names wider. Focusing on non-financials, Europe (ITRX Main exFINLS) underperformed US (IG12 exFINLs) with the former trading at 148.88bps and the latter at 151.55bps. Cross Market, we are seeing the HY-XOver spread decompressing to 455.03bps from 435.34bps, and remains above the short-term average of 441.37bps, with the HY/XOver ratio rising to 1.55x, above its 5-day mean of 1.51x. The IG-Main spread decompressed to 26bps from 22.91bps, and remains above the short-term average of 23.67bps, with the IG/Main ratio rising to 1.18x, above its 5-day mean of 1.15x. In the US, non-financials underperformed financials as IG ExFINLs are tighter by 8.2bps to 151.5bps, with 91 of the 104 names tighter. while among US Financials, the CDR Counterparty Risk Index fell 11.82bps to 206.88bps, with Finance names (worst) tighter by 17.6bps to 943.38bps, Banks (best) tighter by 18.08bps to 269.25bps, and Brokers tighter by 15.13bps to 247.08bps. Monolines are trading wider on average by 104.14bps (3.77%) to 2703.54bps. In IG, FINLs underperformed non-FINLs (4.1% tighter to 5.13% tighter respectively), with the former (IG FINLs) tighter by 19.5bps to 454.8bps, with 17 of the 21 names tighter. The IG CDS market (as per CDX) is -2.3bps rich (we'd expect LQD to outperform TLH) to the LQD-TLH-implied valuation of investment grade credit (176.32bps), with the bond ETFs outperforming the IG CDS market by around 4.98bps. In Europe, ITRX Main ex-FINLs (underperforming FINLs) rallied 4.35bps to 148.88bps (with ITRX FINLs -trending tighter- better by 8.04 to 144.5bps) and is currently trading tight to its week's range at 0%, between 162 to 148.88bps, and is trending tighter. Main LoVOL (sideways trading) is currently trading tight to its week's range at -0.06%, between 109.66 to 104.74bps. ExHVOL underperformed LoVOL as the differential decompressed to -3.68bps from -4.94bps, but remains above the short-term average of -7.38bps. The Main exFINLS to IG ExHVOL differential compressed to 47.83bps from 53.34bps, but remains below the short-term average of 55.87bps. CDR LQD 50 NAIG091 -11.47bps to 231.88 (3 wider - 46 tighter <> 39 steeper - 11 flatter). CDX12 IG -1.75bps to 174.25 ($0.08 to $96.78) (FV -9.73bps to 198.78) (7 wider - 109 tighter <> 75 steeper - 49 flatter) - Trend Tighter. CDX12 HVOL -12bps to 405 (FV -29.56bps to 521.42) (0 wider - 30 tighter <> 27 steeper - 3 flatter) - Trend Tighter. CDX12 ExHVOL +1.49bps to 101.38 (FV -4.24bps to 110.28) (7 wider - 88 tighter <> 37 steeper - 58 flatter). CDX11 XO -13bps to 435.9 (FV -19.79bps to 493.66) (2 wider - 31 tighter <> 28 steeper - 6 flatter) - Trend Tighter. CDX12 HY (30% recovery) Px $+0.13 to $75.63 / -5.4bps to 1283 (FV -47.8bps to 1161.45) (15 wider - 80 tighter <> 78 steeper - 20 flatter) - Trend Tighter. LCDX10 (55% recovery) Px $+0.44 to $76.64 / -30.42bps to 1330.42 - Trend Tighter. MCDX11 -17.5bps to 190bps. - No Trend. CDR Counterparty Risk Index fell 11.82bps (-5.4%) to 206.88bps (1 wider - 14 tighter). CDR Government Risk Index fell 1.34bps (-1.94%) to 67.8bps. DXY strengthened 0.17% to 85.23. Oil rose $0.76 to $50.01. Gold fell $15.3 to $875.75. VIX fell 0.38pts to 35.79%. 10Y US Treasury yields rose 7bps to 2.84%. S&P500 Futures gained 1.31% to 859.6. A different way to look at the late market rally is that it is options related ahead of tomorrow's option expiration... Since index options expire on the opening print, any trading has to be completed today, explaining the trading spike late in the day. Thus, dealers who are short SPX calls have to keep buying futures or SPX cash baskets to keep their hedge on, resulting in purely technical fluctuations in the market. with knowledge of the discussions. matter, who asked not to be identified because the talks are private. The Detroit-based automaker is planning to announce the offer no later than April 27, because the U.S. Securities and Exchange Commission requires that investors have a month to decide whether to participate, according to one of the people. Bondholders may also be offered accrued interest in cash, though the terms of the new exchange are preliminary, the person said. initially demanded. GM is trying to prove it’s viable, a U.S. requirement to keep $13.4 billion in federal loans. The original loan terms called for GM to slash two-thirds of its bonds through a debt-for-equity exchange. “A successful bond exchange is an essential element of our restructuring efforts, and we are working aggressively to launch the exchange,” Renee Rashid-Merem, a GM spokeswoman, said. Last levels seen during the fiasco after the November crash. Was at 0.08% two days ago. All money is running for near term safety, despite CNBC's urges for tresury investors to jump into equities - well, the opposite is happening...Maybe the real money is seeing something, and is accelerating purchasing of T-bills into this melt up. Equities: have fun buying stuff. "Large quant blow up in progress right now"
Yet another troubled REIT Duke Realty has jumped on the Kimco, ProLogis, etc. Merrill Lynch/BofA orchestrated mass dilution bandwagon, and investors, some confused about what the hell is going on, others like Cohen and Steers, are more than happy to join the great pump and dump even as all REITs face imminent debt maturities, declining lease rates, tenant bankruptcies, and generate less and less cash flows to satisfy their respective debt loads, let alone dividend payments. As for use of proceeds: no surprise there - pay off amounts outstanding under the company's $1.3 billion JP Morgan and Bank Of America arranged credit facility (yes, observant reader, the very same companies who are underwriting this travesty). This is exactly the kind of "deal" that Zero Hedge reported about when Kimco raised equity, however without the same day upgrade by Merrill analysts. The Stardust line on Sakwa's upgrade to Buy is 4 days. We take the under. Here are the facts: Duke has priced 65.4 million shares, and will likely also place the 9.8 million share green shoe, once Merrill analyst Stephen Sakwa goes unrestricted and changes his opinion on the company from neutral to buy, although that condition is neither sufficient nor necessary (we jest, everyone knows that Steve Sakwa will evaluate the company on it's own standalone merits). The 75 million new total shares will be a 50% dilution of the total existing shareholder base of 148 million. But, as Merrill has likely pitched to both the management team and to investors: it has worked so far, no reason why it should stop. This is the same reason bulls give to explain the market run up. Nobody needs to be bothered with such trivia as fundamentals, cash flow, FFO, EPS, and dilution. The game of greater fool is on right now like it has never been, and if big funds like abovementioned Cohen and Steers manage to get a quick bump up in their March P&L, so much the better. Underwriting Banks -> New Equity Investors -> Company -> Underwriting Banks Who Are Also On The Hook For The Credit Facility: the buck stops here, compliments of the fresh money. Clinically simple and elegant. Ignore that GGP has filed for bankruptcy. Rinse and repeat. And, yes, it will work, until the potato gets too hot... just like all other doomed REITs, just like the market. Ironically, now that pretty much all the REITs will receive new equity money, the whole thesis that the strong will acquire the weak flies out of the window, and instead of excess capacity getting removed from the market (for a good case study of massive excess capacity, please see the vivid example of Ainsworth Lumber, Norbord and Louisiana Pacific in the OSB market), it will just stay there indefinitely, destroying any pricing power the REIT "giants" such as BXP and SPG could hope to generate. Compliments of Merrill Lynch, irrational exhuberance and a 110x trailing P/E.